Bonjour! 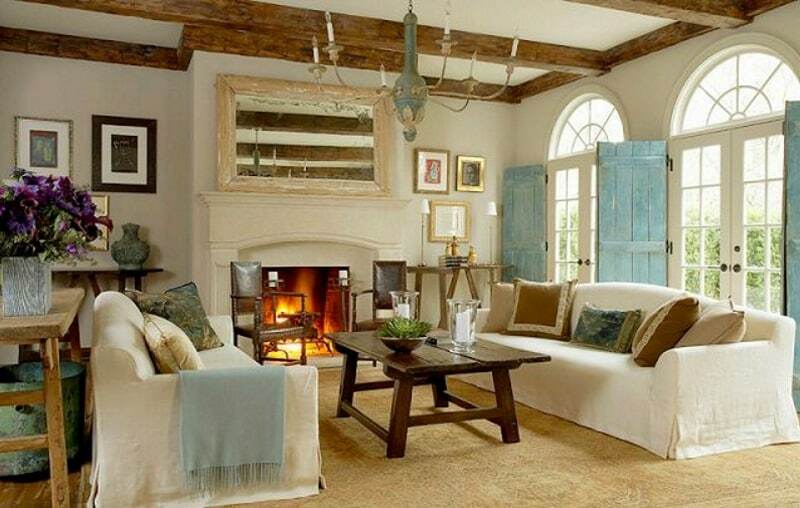 Welcome to our gallery of country living room ideas…we hope you enjoy them! Country living room styles hark back to the simplicity of old American or French rural traditions — indigenous textiles and handmade materials with timeless accents and warm colors. Rooms surrounded with familiar heirloom furniture and décor providing a comfortable embrace that calls on people to congregate and stay. Old is not necessarily unusable! You can make use of vintage tables from a barnyard sale, grandma’s mismatched chairs and mementos mixed in with new chic finds. Also consider a distressed look by sanding edges to give your store-bought dressers an “antique” look. And how about a touch of practical shabby chic by covering couches with slipcovers? In fact, you can create a different look every season simply by switching it up with a variety of floral or tartan designs. Also, mixing antique pieces and travel finds will give the room that timeless appeal and artful mélange that give their soul to many country living rooms. So are you ready for a country detour? 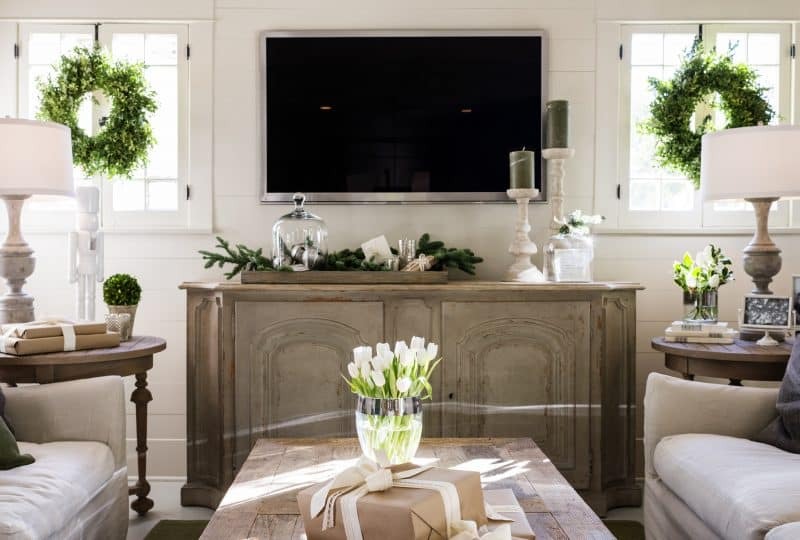 Hope you will enjoy the country living room ideas we selected for you. We found quite a bit that can be adapted to many décors…hope you do too. Enjoy and beautiful day to you! The Little Plus: the French doors with transom windows that give an unobstructed view of the garden. Touches of seafoam green on the repurposed shutters and throw give the room a relaxed vibe bringing back memories of cozy couch stories with grandma. By reflecting natural sunlight, the distressed wood above-mantel mirror brightens up the room and beams the eye upward bringing to your attention the exposed wood beams and that antique chandelier. 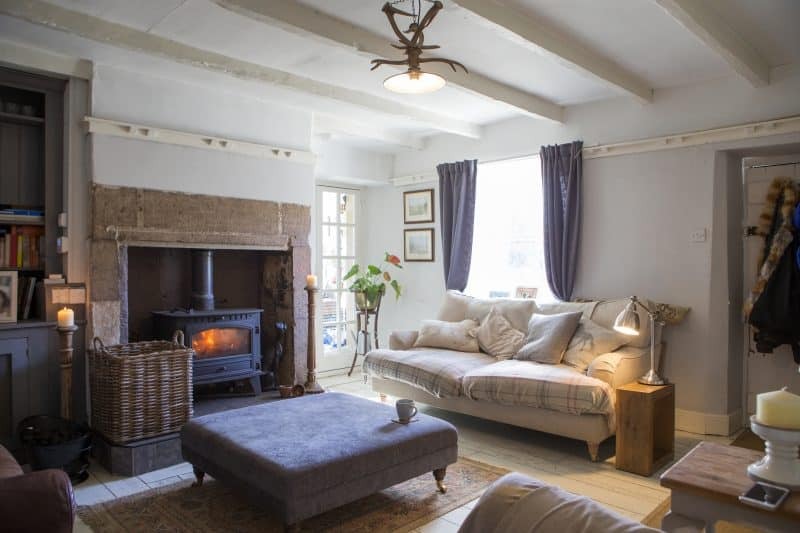 Wooden tables, armchairs and the toasty fireplace visually and texturally warm up the space and the gentle dancing flames of a fire make people feel totally at home. The Little Plus: the stunning Tuscan-inspired basement living room with beige stone walls. It is impressive how something so hard and cold can turn into a warm and welcoming space! 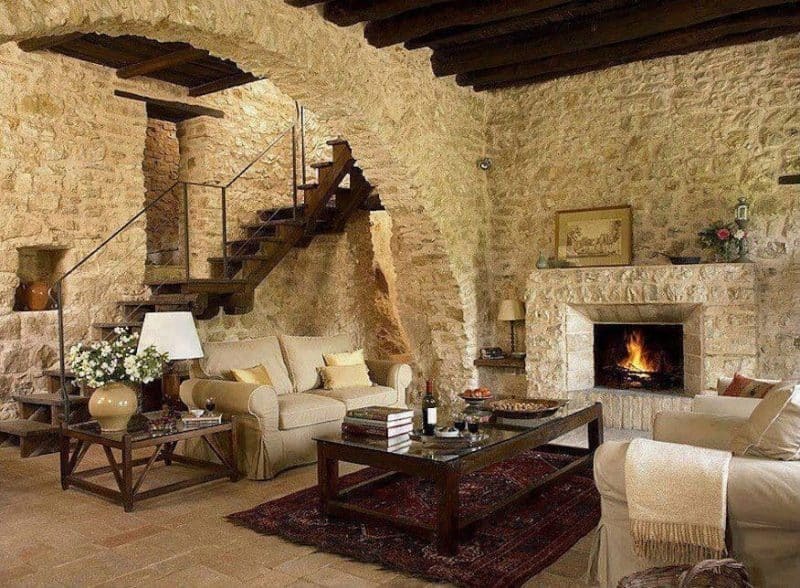 The textured stone walls and arch balance out the neutral color hues of the room, as does the dark wooden staircase with wrought iron railing and exposed wood beams with their contrasting dark finishes. Also, notice the alcove with the vase accent — gives off that archaeological find vibe! The Little Plus: the centerpiece upcycled distressed light wood cabinet — such a beautiful piece for this ethereal shabby chic living room. Inviting in its simplicity, the mini French windows are a great source of sunlight while fresh white flowers depict pureness and the topiaries, wreaths and sprigs sing out against the calming white walls and floor tiles. 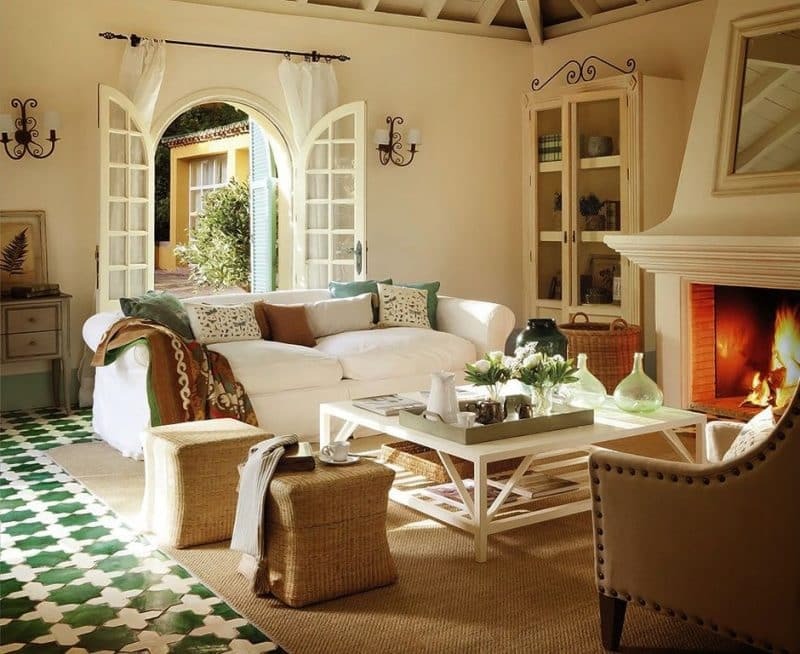 The Little Plus: the romantic ecru and seafoam green arched windows and shutters as it opens up to this Mediterranean-inspired living area with its intimate seating and mismatched cushions. And notice how the lively green and white Moroccan-inspired mosaic floor complement beautifully the seafoam green baseboards. And like cupid watching over the romance unfolding, the golden glow of the fireplace and its custom designed crown molding fills the room with love and joy.